The 30-day readmission rate after acute heart attack is as high as 17%. In the United States, someone has a heart attack about every 34 seconds. Of the approximately 735,000 Americans that have a heart attack, more than half will also have a PCI (percutaneous coronary intervention) and/or a stent. With short hospital stays and little time for education, it is important to provide patients with thorough information about their medications and their risk factors, as well as necessary lifestyle and diet changes to prevent another heart event. 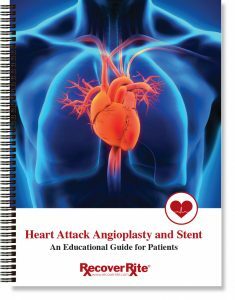 Our Heart Attack/Stent patient guide is divided into easy-to-understand sections for educators to use with patients in conjunction with their discharge protocols. Medication log, Exercise log, etc.